On your way to the wonderfully named breakfast place, I realized I kept asking myself: “how far is this place?” Google maps is somewhat deceptive in how far it really is. Once you arrive you notice it is in this strip mall that is jammed packed with cars and you really need to look for a parking spot. I found some in the back, but others park in adjacent parking areas or look a block or two away. The place is technically called Le Breakfast Club & Moulerie. It’s and odd pairing to have a breakfast place and a mussels place in the same building but if it works, who am I to judge? Once you walk up to the Breakfast club you notice a small line forming outside. It is only a few minutes then, when you get in there’s a second line that is also a couple minutes. The moral of the story is to get there early or be ready to wait. They have a fully wheelchair accessible premises which is a nice touch. The inside was divided into two sides: one is more breakfasty with a bar and live jazz on Sundays and the other sire is more of a dining area. The menu is pretty thorough and does a good job of covering the basics as well as some very creative twists on old classics. I mean, they have dishes that combine waffles and eggs benedict as well as eggs benedict on latkas, and even dishes with lobsters. These are some very creative breakfast ideas that ensure you will never get bored with the menu and this menu if quite exhaustive so you get lots of choices. Prices are quite decent and varied with fancier dishes costing you around $12 and your simpler basic ones will be starting at $7. They even included waffles, French toast and crepes in a section to save space and they give you access to the same toppings which is a smart idea. 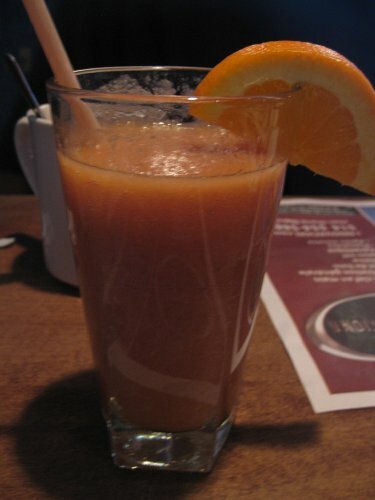 We started off with a fruit juice ($3.75). The size was normal and the taste was good – overall, it was well worth the money. Next came the Eggs benedict waffle dish ($9.95) which was an interesting fusion of a an eggs Benedict served on top of a waffle piece. 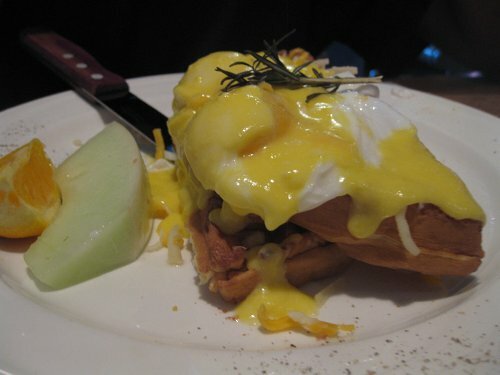 This is quite a filling dish since waffles are usually doughy and an eggs Benedict leaves everyone satisfied at the end. There was hollandaise on it that was just ok and there was also a side of two pieces of fruit which was kind of Spartan and it came with coffee. The waffles were quite decent, the eggs were good, although the sides of fruit were not enough and a side of potatoes would have been nice. In all considering its under $10 then that’s ok. 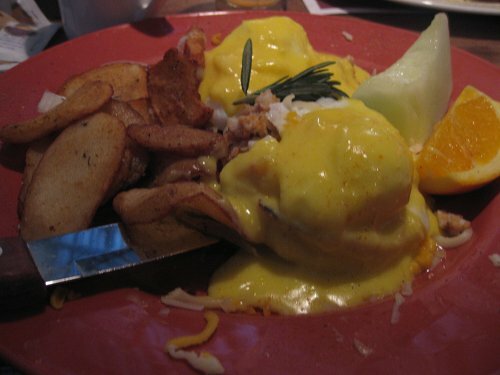 The lobster benedict ($12.95) intrigued me the moment I read it on the menu. I have never had eggs Benedict with lobster before and being an eggs benedict fan my adventurous side needed to see what this was like. The dish came with two poached eggs on English muffins, home cut fries, and two pieces of fruit. The hollandaise sauce was, once again, just ok but the eggs were properly done. I did not notice a pronounced taste of lobster and in fact, I barely noticed it at all. It makes sense that you would not get a ton of lobster at a price of $12, but it was uninspiring, and I should have gone with something else since I really wanted lobster. 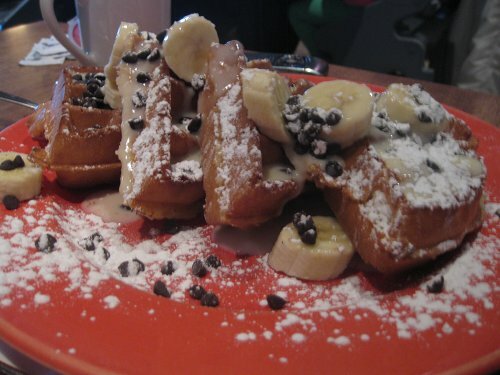 Lastly came the chocolate waffles ($9.95) and this was 4 nice pieces of waffles topped with sugar, chocolate chips, bananas and English cream. I normally do not like English cream but in this dish it was amazing and the dish is fun to look at, filling and tasty. This dish was the stand out dish this day and at under $10, it’s an amazing deal. This dish combines a fun presentation and a really solid taste. It pretty much delivered where it needed to and exceeded expectations especially since I find that these chocolate chips fun dishes tend to disappoint. If you have a craving for something sweet, check it out. Our waitress was really nice, funny and made good jokes. She also came back to check up on us. In fact, all the staff was nice from the hostess to the bus boy. Most dishes here are not meat focused and there are also lots of choices in the health menu section with potential for one or two vegan options which will likely be fruit dishes. Considering the price you pay, Le Breakfast club is a safe bet in the south shore. 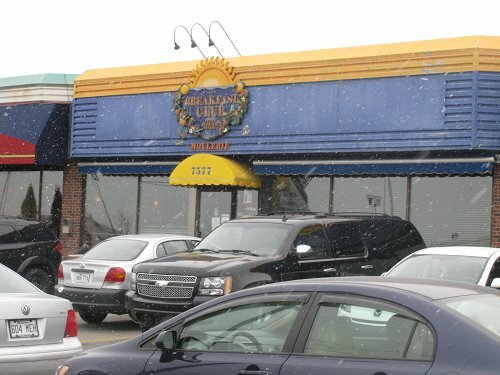 If you live on the south shore or find yourself here, make sure you check this place out. Pick your items carefully and I would suggest avoiding fancy dishes like the lobster and go for the more classic north American dishes like the chocolate chip waffles. Parking can be a pain, and there is slight wait, but its not too bad. The live jazz band is a great addition and the fact that it is open all week long and until late is another big bonus.